Who knew that synthetic hair could look this poppin’ in real life?! With all the hair brands popping up on the interwebs it might feel hard to just choose one, right? We know. But get this — Curkalon Hair is different. How might you ask? 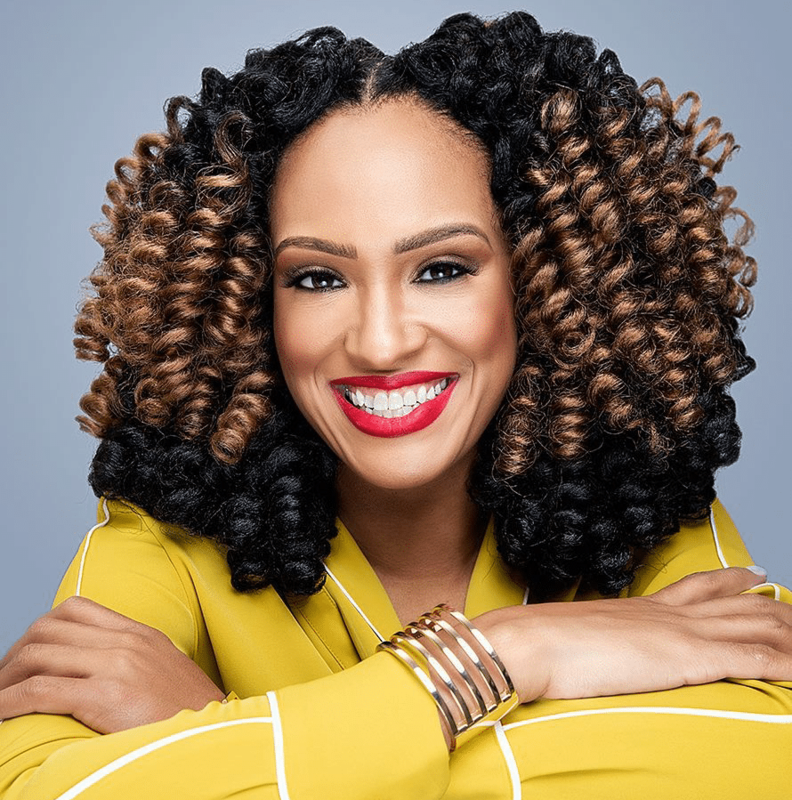 Curlkalon Hair is the first protective styling brand to offer women pre-looped and pre-curled synthetic hair that has been designed to match a woman’s natural hair texture. Which means if you are looking for a fast, affordable low maintenance hair care options that blends seamlessly with your natural hair — Curkalon is it. Now, we get it – some of you will only stick to human hair wefts and the companies that you’re used to. But once you hear how Shavone Riggins, the founder of Curkalon Hair, turned a problem she faced as a natural hair wearer into a 7-figure company in less than a year, you’ll be inspired (like us) to give it try! In this interview with BAUCE, Shavone explains how she built a successful synthetic hair company in an Asian dominated market and she finds time to balance it all as a mother of six children. Take us back in time, Shavone. How did you get the idea for Curkalon Hair? How did you go from working in digital marketing to building your own brand? Shavone: As a natural hair wearer, for now, going on 13 years I was in search of a protective style that looked and felt like my natural. I came across the crochet braid method which allowed for me not only to rock a natural-looking style but also saved me time in not have to deal with the managing of my natural hair daily. I went from the natural blow-out look to then dipping my head with rollers into cups of steaming hot water all the achieve a textured curly style. However, the time frame to create such a style was tedious and took hours. I then took the route of cooking the rolled synthetic hair on my stove to cut out the risk of burn and save a little more time in achieving the style. Then one day a light bulb went off and I said, “Wait a minute, why is it that I can’t go buy this product?” I answered my own question and set forth in 2014 building what we know today and two years later as Curlkalon Hair – Curls in a Box. Once I begin to build Curlkalon, I knew I could not do both at the same time. I began ending many of digital contracts to focus on building Curlkalon solely by giving 70-80 hours a week in dedication. So, the transition was simply having the faith to leap and realize the vision and blueprint I created would be grand. When did you know Curlkalon was a hit? When did you get your first sale? Shavone: I knew Curlkalon would take off at the time of wearing crochet braids with the brand even being thought. I was immersed into this community of women rocking natural hair that would give me feedback on my styles as I wore them and shared them on social media. Therefore, I knew who my target audience would be and how to speak to them in providing what I knew they were drawn to. Curlkalon launched in April 2015, in which we landed our first sale. Did you take any outside investments or loan to start your company? Would you recommend this? Shavone: No, Curlkalon is a grassroots built company. I used my very small savings to start Curlkalon with a determination to make it profitable within 1 month and it worked. Taking investments and loans will always present a risk if the blueprint of starting and launching a company is not planned thoroughly with keen business knowledge based on the specific industry. You have built a 7-figure company, which is no easy feat. Can you explain how exactly you did this? Shavone: I took every experience I had in business as a previous entrepreneur and digital marketer and used every skill set, tools, along with my blueprint and vision for making Curlkalon a reality. I have always been a dedicated and “don’t stop til’ it’s done” type of person. When problems or issues arose I took them head-on. Honestly, I didn’t know Curlkalon would hit the 7-figure mark in less than a year. As I look back I made some great decisions in hiring, delegating, and processes that kept a consistent level of growth. What was your key to getting sales? Does social media or in-person demonstrations help you convert people into customers? Shavone: The key to getting sales was firstly identifying my target audience and communicating with them in their voice. Showing them a way to save time and introduce convenience for a style they desire. Yes, both are great forms of marketing! Social media is definitely a way to convert people into customers through hashtags, images, videos, and engagement. If you’re not using social media, then you’ll definitely miss the ball on placing your product or service in front your potential customer. The hair industry is super lucrative but also becoming heavily competitive, especially by independent sellers. How does Curlkalon stand out from the bunch? How do you make sure your brand is top of mind for consumers? Shavone: We are in an Asian dominated market (synthetic hair). We strive to set ourselves apart through showing that we embrace natural textured beauty to women who look just like us. We make sure to provide quality hair, stand out style ideas, and ultimately share the success of our consumers with our consumers – be social proof. Let’s talk about self-investment. Did you take any business courses or receive any leadership coaching before starting your business? How do you invest in yourself as a businesswoman? Shavone: My self-investment came for my determination to be resourceful in always getting the information I needed to make business decisions. I took some IT courses at a community college and dropped out two courses short of graduating. I spent hours on hours in front my computer with Google and YouTube learning and never saying “no” to clients when requesting services I had never done. I built my very first business as a jewelry designer that propelled me into being a professional freelance web and graphics designer, then into having my own digital company and now founder and CEO of Curlkalon Hair. Outside of your business, you are a busy mom of 6! How do you balance both running a company and being a mom? Shavone: Indeed I am! My children are 20 years of age to 3 years of age. I’m blessed to have family who support me, my children and my dreams. The mention of the word balance is always the idea of juggling. However, for me, it’s more of prioritizing what I do while never forgetting about whats most important. Some days certain aspects of business and family get 20% while the other gets 80%, but I never stray away from the ultimate goal. What would be your advice for a young woman who wants to do what you do? What would you tell her? Shavone: Know that there is a purpose for your life and there is something great for you to accomplish and to succeed in. Many times we can get lost by listening to others, even those close to us that may have a good intention. However, you have to learn to “kill the noise”. Find your voice, find your passion, not by way of others. To build anything you need to have a foundation and you are the foundation builder! Build with integrity, morals, principles, and values to find your passion into your purpose. Want more business advice from Shavone? Head over to her personal website to connect with her. You can also follow her on Instagram. Very impressive and excellent article. I like it.